New Zealand South Aviation Chart. 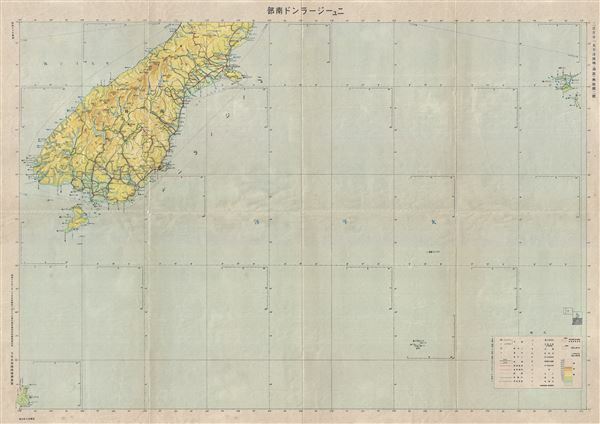 This is a scarce 1942 or Showa 177 Japanese map of southern New Zealand issued by the Japan Army General Staff. It covers the southern portion of the South Island, the world's 12th largest island, including Stewart Island and Auckland Island. This World War II era map is highly detailed and notes important cities, towns, rivers, roads, shipping lines and other important topographical features. All text is in Japanese. Very good. Minor wear and verso repair along original fold lines. Overall age toning.